This week’s tip on hearing impairment comes from the New York Eye and Ear Infirmary of Mount Sinai. All newborns are given a mandatory hearing test before leaving the hospital. Screening and diagnosis helps identify babies who are deaf or hard of hearing so they can receive early intervention services. These services can make a big difference in their development. What does it mean that my baby “failed” his/her newborn hearing screen? This non-invasive screening test is able to detect a possible hearing impairment or deafness within a few days of life. Hearing is critically important for a baby’s development and is very closely linked to early language development in the first few years of life which is why it’s important to identify a possible hearing loss as soon as possible. There are many reasons that your baby may have failed the newborn screening test. Because it is a screening test, failing the test doesn’t always mean your child has a permanent or severe hearing impairment. Approximately 2-3 infants per 1,000 are born deaf or with a severe-profound hearing impairment. 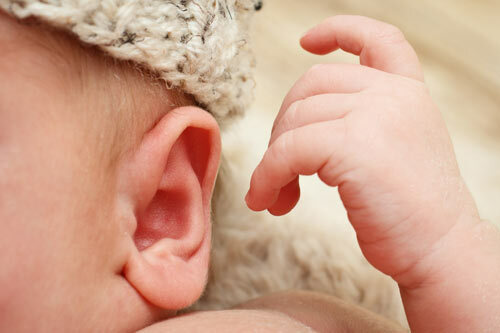 Hearing loss can also occur after birth and can be related to infections or other medical problems that can occur around the time of delivery. It is important to have a trained audiologist perform additional confirmatory testing to assess your baby’s condition. How would I know if my baby is hard of hearing or deaf? In the first few years of life, hearing impairment may present in many different ways and can be hard to identify. If you feel that your baby is not meeting their developmental milestones to speak, play, or communicate, you can also speak with your pediatrician about an evaluation through the Early Intervention Program. Since hearing impairment can impact your child’s ability to develop speech, language and communication skills, it is of utmost importance that your child receives appropriate services, and possible amplification or other treatment as soon as possible. If you think your child or family member may be hard of hearing and would like to schedule an evaluation, please click here for more information.